Last August the Village of Sunbury annexed what was known as the Price Property into the Village. The Expedited Type II Annexation of 183.912 acres immediately adjacent to Dominion Homes Sunbury Meadows Subdivision has been slated for development by Fischer Homes. Jason Wisniewski, Fischer Development Company Vice President of Planning and Zoning, was in chambers during last Monday evening’s Village of Sunbury Planning & Zoning Commission meeting for an informal presentation about a 210-acre, 522 single-family home development called Price Ponds. Wisniewski said Fischer Homes, founded in 1980, is privately owned and has been in the Columbus market since 2008. The builder is in 30 communities, including Indianapolis and Atlanta, and is number 40 on the Builders 100 list. 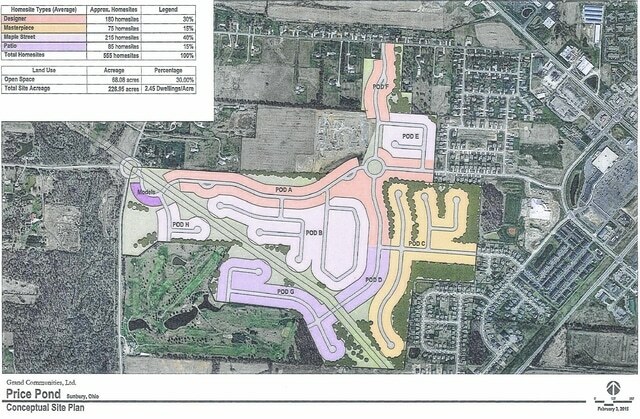 Wisniewski described a development with five logical access points leading to a central roundabout, with 67 acres of open space, 50 percent more than required by Village code for a Planned Residential Development. The Price Ponds concept plan also shows space for an elementary school, meadow areas, wooded areas with dirt trails, a paved bike and hiking trail, pocket playgrounds, fitness areas, and four different home collections. The Maple Street Home Collection, designed for a young family and first-time buyer, includes homes from 1,200 to 3,000 square feet and would start in the $210,000 range. The Designer Home Collection would be for the move-up, second time buyer. Designer Homes would be 1,600 to 3,000 square feet and sell in the $300,000 range. The Masterpiece Home Collection would be for the second move-up buyer, established families. Masterpiece Homes would be between 2,200 and 4,000 square feet and sell in the $390,000-plus range. The Patio Home Collection would be for empty nesters that want low maintenance lifestyles, be between 1,200 and 2,400 square feet, and sell in the $260,000 range. Wisniewski said Designer and Masterpiece homes would line the main streets in and out of the development, creating a high-quality streetscape; Maple Street and Patio homes would be sited on long cul-de-sacs.